04-Oct-2015 -- During my brief stay in Albuquerque, I had originally planned to spend the afternoon mountain biking in the Sandia Mountains, but the weather there was bad, so instead I decided to attempt to hike to this Degree Confluence Point. My approach was the same as that taken by Shawn Fleming 4 years ago: I took I-40 to exit 140, then drove about 3.5 miles along the north frontage road until reaching the freeway underpass at 35.01888°N 107.00335°W - 1.3 miles from the point - where I parked and started hiking through grassland towards the point. The terrain started out flat, but turned into rolling hills as I approached the point. 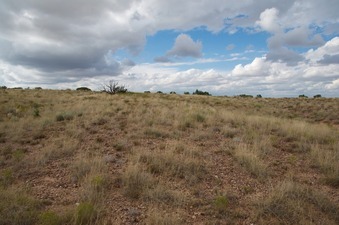 The soil was sandy, with grass (often growing in patches), and the occasional cactus. The confluence point lies near the top of a ridge. On my way back to Albuquerque I stopped and hiked at “Petroglyph National Monument” - on the western edge of the city. This involved a 2.2 mile hike, giving me almost 5 miles of hiking for the day. In the Laguna Indian Reservation.